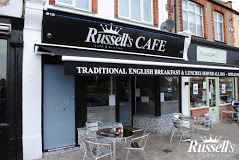 I hope people who follow my blogs don’t get the wrong idea … but this morning following working out at the gym I decided to have breakfast at Russell’s Café & Bistro, in Hamstel Road. I have passed this place on a number of previous occasions but had not gone in as much because of no nearby parking. But today I was passing and there was a space outside and I fancied an English breakfast, which often happens. When I went in, there was only one other customer and I was served by a lady who was quietly pleasant during my time there. I decided to go for their basic offering, although I later realized for not much extra cost I could make it into exactly how I wanted. The café was bright and airy and gave the impression of being more plush than your norm. Looking at the menu, they do a lot more than breakfasts and it looked good. I decided to read the paper (the Sun which seems the standard) and was followed quickly by tea, then toast and then breakfast. I enjoyed my breakfast which included extra bacon, better than normal sausages, a decent size cup of decent tea and hash browns as standard, all of which was more than acceptable quality wise. While not outstanding value it was reasonable. I might well return if passing and if there is a space to park. ← To be involved or not to be involved?